Steve Heimoff was born and raised in The Bronx. It was his post secondary education that took him away from New York City, placing him in an academic, New England environment. Here, he received his Bachelor of Arts degree in philosophy from Clark University, Worcester, Massachusetts (his emphasis was on existentialism). 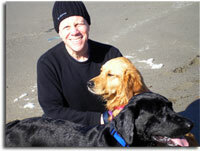 After graduation in the late 1970s, Steve moved to San Francisco where he went on to receive his Master’s Degree in educational technology from San Francisco State University. After three years of working within the corporate environment, Steve realized that he yearned for something more creative and fulfilling. In what can only be described as a serious soul searching session, Steve pondered his twin passions of writing and wine, earnestly contemplating how he could combine the two interests in order to be gainfully employed. Taking a major leap of faith, Steve set out to become a wine writer. Starting in the early 1980s, Steve immersed himself in a serious course of self-education in all aspects of wine appreciation. He joined the San Francisco chapter of Les Amis du Vin (at that time, one of the nation’s leading wine amateur societies). He frequently haunted San Francisco’s top wine shops, asking questions of the staff (such as, “What is the difference between Cabernet Sauvignon and Cabernet Franc?”). He began collecting wine books, old and new (and today is the proud owner of a small library of them). He started keeping his own wine diary, writing reviews for himself and comparing them with those of published wine critics, such as Anthony Dias Blue and Bob Thompson. By the mid-1980s, Steve was conducting informal wine tastings for friends, family members and co-workers. And, of course, he visited wine country whenever he could. By 1990, Heimoff began a 4-year stint as writer of The Collecting Page, which was always the final page in the Spectator. This assignment focused on issues of special interest to collectors. This period brought Steve deep into the complex world of wine. During this period, he also wrote industry-oriented articles for Market Watch magazine, which gave him an appreciation that wine is not just an esthetic but a business. In March, 2014, Steve left Wine Enthusiast and became Director of Wine Communications and Education at Jackson Family Wines. He continues to work out of his home in Oakland, where he lives with his little dog, Gus. Steve Heimoff’s Lesson: If you have a passion and believe in yourself and work very hard, you can make it at anything. I really love the new layout and masthead of the blog, Steve. I’m a freelancer writing about the sale of Elliston Vineyards in Sunol. Its website said Don Blackburn was the winemaker there from 1985 to 1990. Know anything about that? Harry, I don’t know if Don was the winemaker at Elliston. Don sadly died some years ago. He was a sweet man. Dear Hal, I’m afraid I’m not the right person so ask. I simply don’t know. Perhaps you can do some internet research. Dear Mr. Heimoff, I am an economic consultant preparing a proposal to complete a feasibility study for a new proposed wine heritage center in Virginia. If you are interested I will include you on my team as an advisor/consultant, as an expert on wine marketing. Let me know if this is of interest to you. I envision that you would travel to the region, conduct a tour, and offer your conclusions on it’s feasibility and suggestions for success. yes, Don was the winemaker at Elliston (I visited him there a few times..) then went on to Bernardus for several years before ending up at Emeritus in Sebastopol. Having been in wine sales and education as a retailer,writer and buyer,surprisingly,I just discovered your site. I’m wondering however, how all these polemical political essays of yours got into this blog site? Is this something new for you or do you “deem” yourself a political commentator also? Another question: How do you get your SEO optimized for TWO niches;unless your political essays are just filler for space. Dear HOWARD, at first I thought your comment was spam, but it may be real, so I will answer you. I formally retired from the wine business on Sept. 2 of this year, and told my readers at that time that, going forward, my blog will be about anything I want, especially (but not necessarily limited to) politics. I don’t “deem” myself anything. That’s for others to determine. As for SEO, I never gave it a second thought, and I certainly don’t care now. Thanks for writing. Appreciate the comment. As I just found your site, no I was not aware of this change, quite naturally! However, you have made me think twice about your ideas on different topics in a blog; contrary to all the expert blogging opinions who swear that a one niche blog is the only viable choice! ( particularly if you want to make some money). So inadvertently, Its good that I stopped by! Steve your vitriol against the republicans is too much and over the top. I used to read your wine reviews, but not so much now. Dear Roger Troll, if you are not as upset as I am by this republican party, then you are one of them: fascist, a religious nutbag and a hater. Steve, are the Baldwin’s still at Justin Vineyards or have they departed? You might be interested in last Sunday’s LA Times California Sunday Magazine’s “A Kingdom from Dust” by Mark Arax. It’s the story about The Resnicks in agriculture. BTW, the following – “Steve your vitriol against the republicans is too much and over the top. I used to read your wine reviews, but not so much now.” – is right on. Anyone who believes in the Republicans approach to life in America has gone over the edge. Of course, the Democrats aren’t pure; but, they’re not racists or white supremacists. They’re not ruining our country by denying climate change. They’re not in disbelief of science. They’re not holy rollers or evangelists preaching/forcing their (religious) beliefs on others. There is somewhat of a parallel between the demagogary of the Republicans towards the rest of America and the demagogary of the Muslim /Islamics against all other religions. In either case it’s their way or the highway. Chuck Cohen, I don’t know about the Baldwins. As for Democrats, they are the best practical hope for rescuing this country from fascism. The Republican party, as I suggested in my post, has become the taliban of America, and must be utterly defeated. Steve, if you are interested in joining the fight to uphold the voters will that defeated measure AA, the original opponents to the measure was organized by the East Bay rental housing association. You can contact them regarding their legal moves and next phases of the strategy.